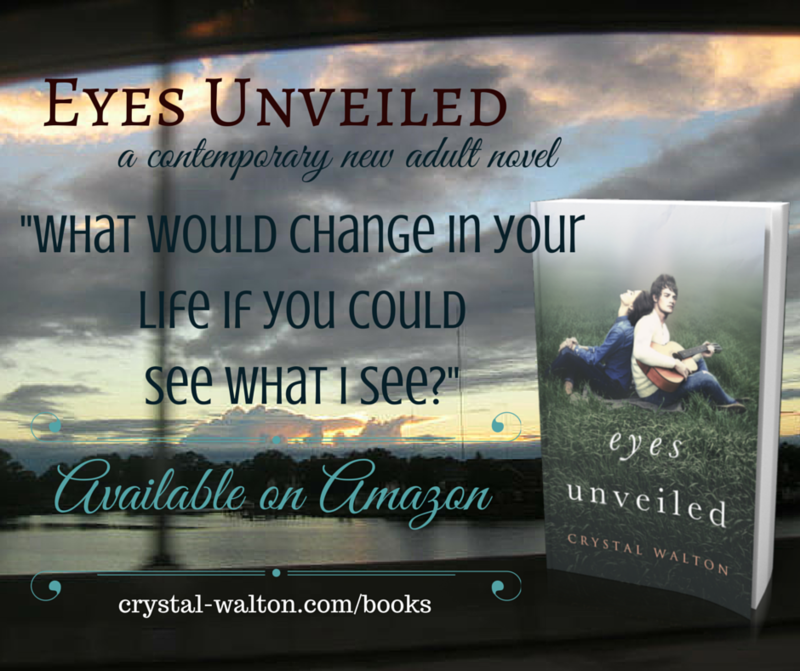 Eyes Unveiled (Unveiled Series, Book 1) by Crystal Walton. Publication: February 1st 2015 by Impact Editions, LLC. Music. Friendship. Self-discovery. Hope. Purpose. Identity. Within this inspirational love story, you'll find you have a song of your own to share. 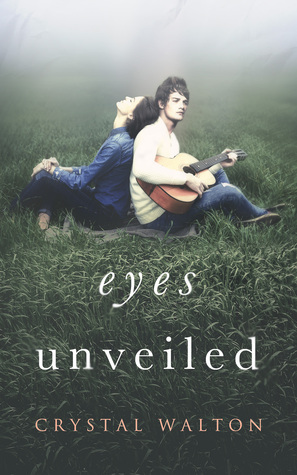 Author Interview Q&A:What inspired you to write Eyes Unveiled? When I first contemplated writing fiction, three musts came to mind. (1) It had to include romance because that’s my favorite part of any story. (2) I wanted whatever I wrote to be relatable. (3) I didn’t want to write simply for the sake of entertainment. As soon as I opened myself up to daydream, a scene fluttered into focus. A guy and girl, college age, sitting in the middle of a secluded field. The guy was playing an acoustic guitar, as much in love with music as he obviously was with the girl across from him. Every chord stoked her love for him the same way it fanned the craving in her heart to find where she belonged. Both fighting what they felt. Both wanting to make the other see what they saw. Physical and emotional tension flared in a palpable tug-of-war between hope and doubt, caution and desire, passion and responsibilities. And right then, I knew these characters had a story to tell—one I wanted to read as much as write. From there, I couldn’t stop the scenes from coming. What made you choose New Adult? I didn’t intentionally set out to write NA fiction. But the truth is, college was the best season of my life. I’d relive it in a second. There's something special about it. Sharing an extended sleepover with your best friends, stepping out on your own for the first time, discovering things like who you are & what friendship really looks like. It's when we fell in love like never before, and when we fell apart like never before. It shaped our lives. One of my favorite parts about Eyes Unveiled is that you get to relive those moments all over again. The laugh-until-you-snort moments. The heart-flutters-taking-flight moments. The on-the-floor-crying-your-heart-out moments. All of it. Doubt. Faith. Friendship. Love. NA is a dynamic genre to read and write. What made you decide to go indie? I started off on the traditional route, but the more I studied publishing, the more passionate I became about going indie. Along with the benefit of keeping the rights to my book, it’s a joy to partner with some amazingly talented contractors. I love getting to offer my books at a low price and still receive a fair royalty, so readers and I both win. And since traditional and self-published authors have to do the same amount of marketing on their own anyway, you might as well be compensated fairly for the investment. Overall, it simply made the most sense. In a word? Passion. As an artist, I leave my heart on the page. Exposed. Vulnerable. Nothing withheld. It’s risky to bear your soul to the world, but that’s the cost of art. There might always be a part of me tempted to guard my heart. But there’s a much more compelling part that’ll never allow me to. Regardless of the outcome, I write what I do because my heart is spoken for. My goal as an author has always been to craft novels that are relevant and encouraging. I love compelling fiction that draws you into characters’ lives to the point of feeling what they feel. The kind that you walk away from knowing the story just impacted your life. Beyond mere entertainment, they awaken dormant dreams, stir creative visions, and remind you that you have a story of your own to live. If you walk away with an emotional connection that touches and inspires you, then I know I’ve written the kind of story I’ve always wanted to. Amidst multiple moves up and down the east coast, Crystal received her bachelor of arts from Messiah College in PA, married her exact opposite in upstate NY, and earned her master of arts from Regent University in VA, where she currently resides with her husband. Crystal writes contemporary new adult fiction fueled by venti green teas from Starbucks. When not working her accounting day job, she's delving into the wonder of words, supporting her Starbucks habit, or laughing over movie quotes & singing eighties songs with her husband. Thanks and thanks for writing so we can escape a little of reality!